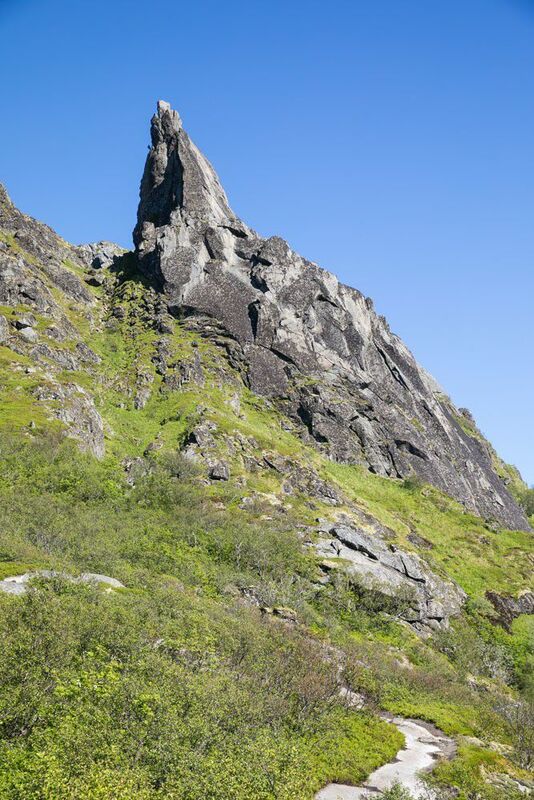 Svolvaergeita, also called “The Goat,” is a pinnacle of rock that is a popular rock climbing spot in the Lofoten Islands. It is named The Goat because of the two horns of rock that sit atop the rock. Those with a sense of adventure can climb to the top of Svolvaergeita and those who are just a little bit crazy can leap from one horn to the other. When I first saw photos of Svolvaergeita, I thought it looked like a crazy thing to do. 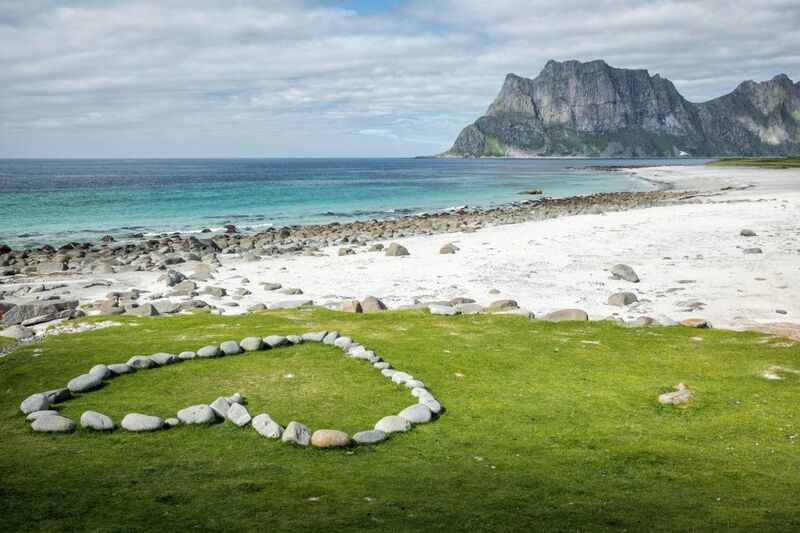 Which is exactly why it got added to our Lofoten itinerary. 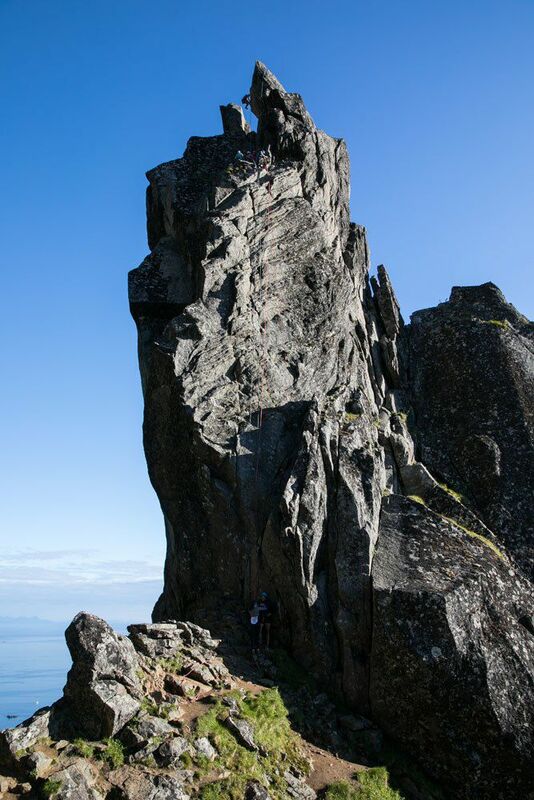 Rock climb to the top of this pillar, take ourselves outside of our comfort zones, and have one of the best views over Svolvaer…of course we wanted to do this! Climbing Svolvaergeita was our best rock climbing experience, ever, and maybe even our top experience in the Lofoten Islands. We used Northern Alpine Guides to climb Svolvaergeita. We all have prior rock climbing experience, but I still consider us beginners, so it was necessary for us to climb with a guide. Plus, Northern Alpine Guides provides rock climbing equipment in their fee, so we did not have to travel with harnesses and rock climbing equipment, a nice bonus! We met Charlie, our guide for the climb, at the Northern Alpine Guides office in Kabelvåg. He fit us with helmets, harnesses, and climbing shoes. Then we followed him in our car 20 minutes up the road to Svolvaer. Before you can climb Svolvaergeita you have to hike to it. The parking lot for the climb up Svolvaergeita is the same parking lot for the hike up Svolvaer Fløya. Parking is located near the Svolvaer cemetery. Yes, you have to park at the cemetery before you climb Svolvaergeita. A little creepy, don’t you think? We found parking on Blåtindveien, just a few steps from the trailhead. The GPS coordinates for the trailhead are 68°14’40” N 14°34’41” E.
Our guide, Charlie, at the trailhead to Svolvaergeita and Svolvaer Fløya. It takes 45 minutes to hike the 1 kilometer to the base of Svolvaergeita. The hiking trail is steep and slippery at times. 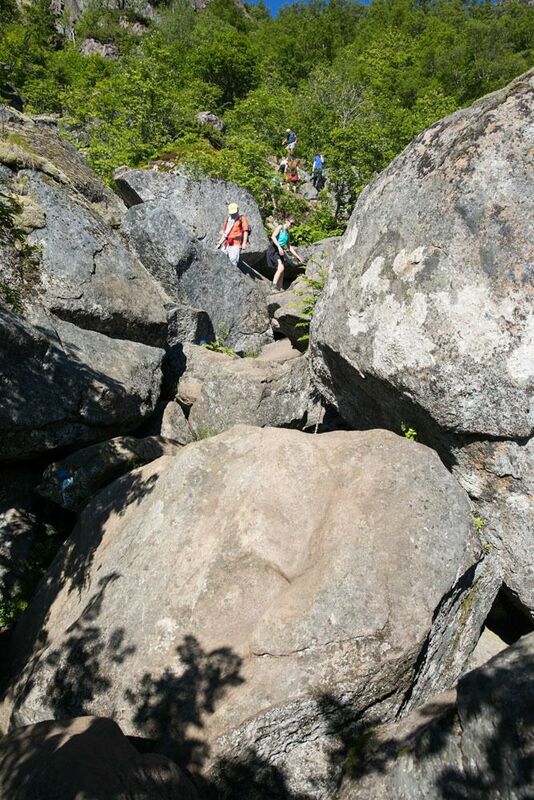 There are short sections of rock scrambling and places where you will need to use a chain to pull yourself up. This hike is challenging, so be prepared to expend some energy even before the rock climbing begins. On the day we climbed Svolvaergeita, the weather was gorgeous. 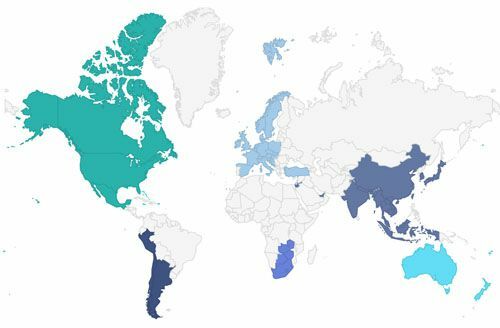 It was unusually warm with a high temperature of 21°C (70°F) with bright blue skies. The hike to Svolvaer Fløya was very busy today and there were more people climbing Svolvaergeita than we expected. 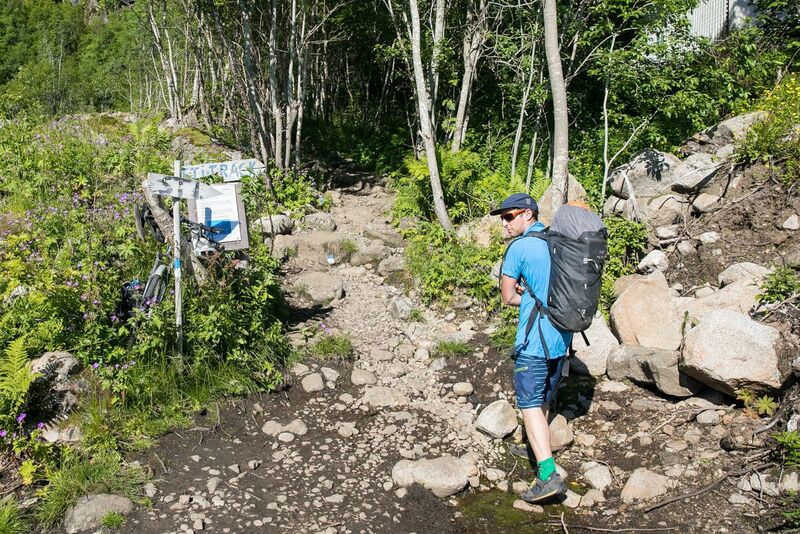 At the base of Svolvaergeita is a flat area where you can change your shoes and stash your bags while you climb. There is only space for 3 to 4 people on the very top of Svolvaergeita, so if there are a bunch of climbers, be prepared to wait your turn. There is also a “flattish” shelf of rock ¾ of the way up the pillar where several people can sit and wait their turn before making the final climb to the peak. This is a climb that beginners can do. There are plenty of handholds and footholds and the climb is only about 50 meters, so it isn’t too long. However, I think it’s a huge bonus to have some climbing experience before you do this, even though Northern Alpine Guides advertises that they can take newbies up this rock. 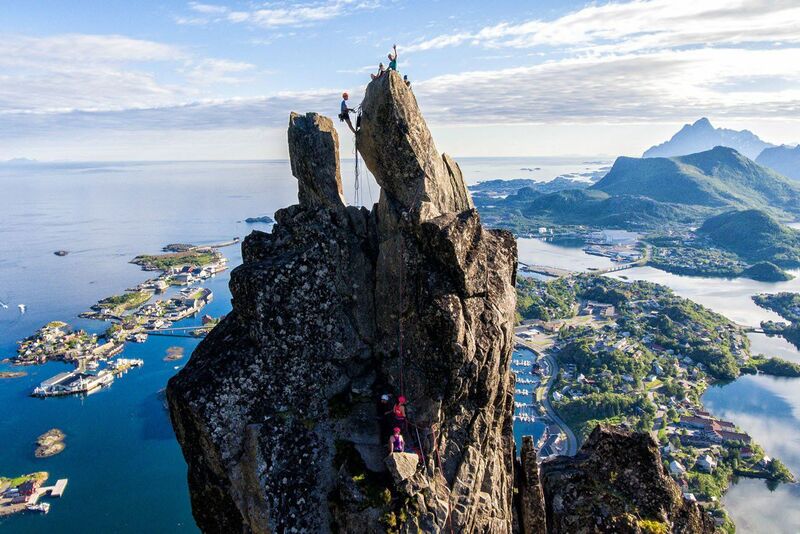 It takes about one hour round trip to climb to the top of Svolvaergeita and rappel back down. It took us longer because of the traffic jam on the day we did this. 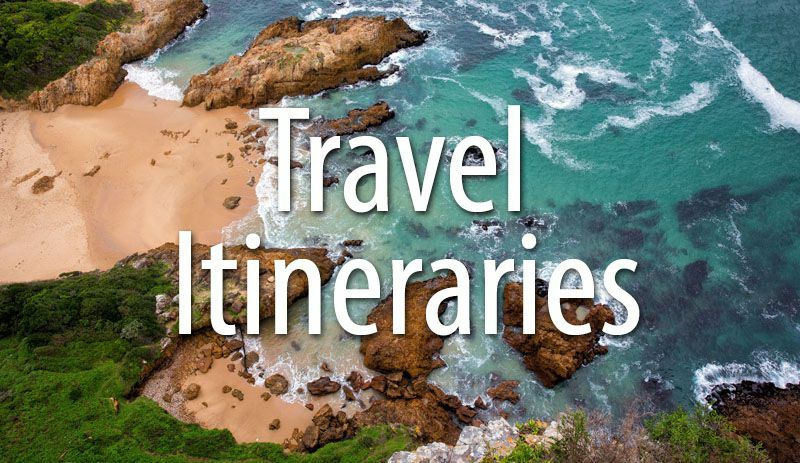 Looking for more adventures to add to your bucket list? 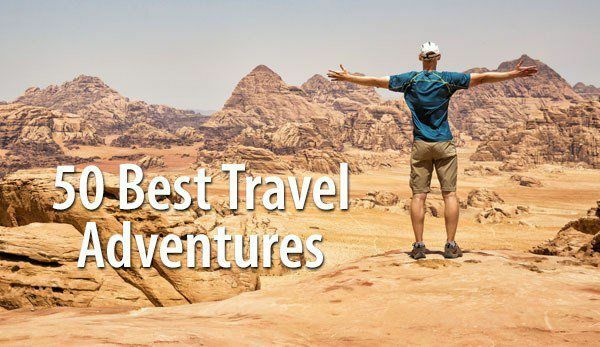 Check out our list: 50 adventures to have in your lifetime. Which ones do you want to do? Charlie divided us into groups of two. Tim and Tyler climbed first followed by Kara and me. Tim and Tyler climbed to what Charlie called the “halfway point,” the shelf of rock that serves as a waiting point before the final climb. Kara and I followed up behind, meeting Tim and Tyler here on the shelf. There were also two other climbers and a guide here, so it was really getting crowded. Then, Tim and Tyler climbed the final portion to the peak and rappelled down from this point. Once they were on solid ground, Kara and I climbed to the top of Svolvaergeita. So, what is it like to climb Svolvaergeita? Challenging, exhilarating, and a tad bit tiring. There is a lot of exposure on this climb, so if you have a fear of heights, you may want to pass on Svolvaergeita. The final climb up the horn is the most challenging section. It’s a tricky climb to the base of the horn. Then, you have to “walk” around the outside of the horn on a very narrow ledge of rock. 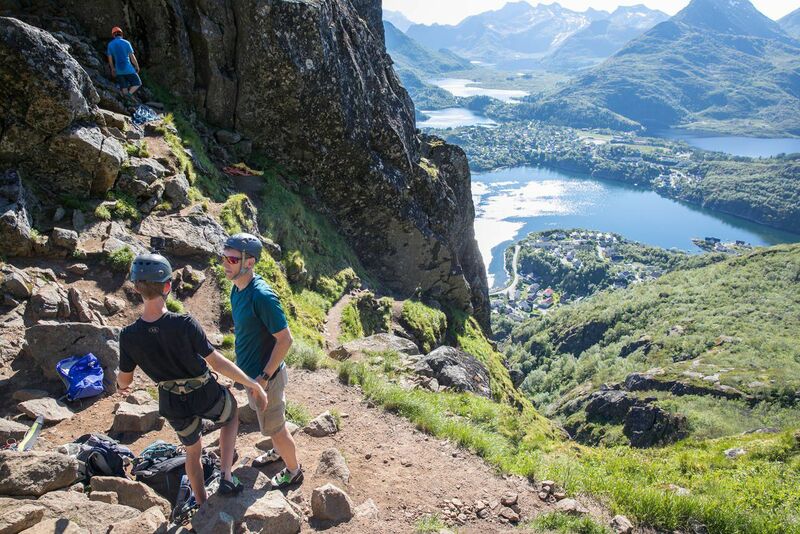 As you edge around to the other side, you are greeted with awesome views of Svolvaer. It’s at this point that you really get an idea of just how high you are, and that can be freaky or exhilarating, depending upon your mindset at this point. Personally, I found this to be a huge thrill. Kara climbing up the horn. Finally, you climb up on top of the right horn. There are not many places to hold onto, and combined with the elevation, this can be very freaky. Even though I was roped in, at times it felt like I could slide right off of Svolvaergeita. The view from the top of Svolvaergeita is incredible. What we were now sitting on was a slanted surface about 1 meter wide and 1.5 meters long. It feels crazy! Enjoy the view!! I am waving from the top of Svolvergeita and Kara is sitting beside me. Tim and Tyler on top of Svolvaergeita. It is a 1.5 meter leap from one horn to the other. It looks easy to do when you are staring at Svolvaergeita in photos. It’s quite another thing to get up the nerve to do it when you are sitting on top of The Goat. It’s a dangerous jump. Yes, you are roped in, so if you miss, you will not go plummeting down into the cemetery below. However, if you miss, you will swing right back into the horn you jumped from, slamming yourself into the rock. We did not take the leap. 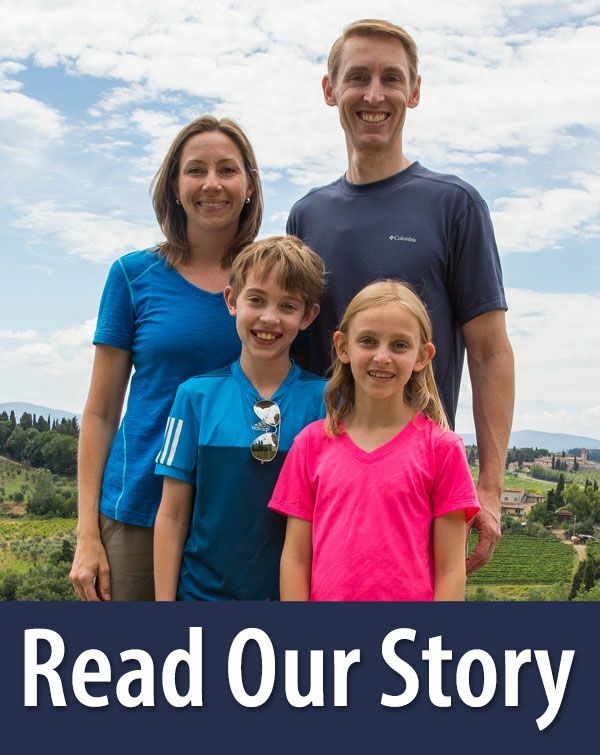 We did not give Tyler and Kara the option, since they are still kids, and Tim and I did not feel comfortable doing it. The trip up Svolveargeita ends with a final rappel to the base of the pillar. As exciting as it is to climb to the top of Svolvaergeita, it is also a thrill, and a bit of a relief, when your feet hit solid ground. Since Tim and Tyler hit solid ground first, they were able to fly our drone, capturing some of the coolest photos ever (all of the photos of Kara and I on Svolvaergeita were taken with our drone). But we weren’t done yet. We still had a mountain to hike! After our climb up Svolvaergeita, we hiked to the top of Svolvaer Fløya, another phenomenal hike in the Lofoten Islands. We made it back to our car at 10 pm…good thing the sun never sets during the summer months here! 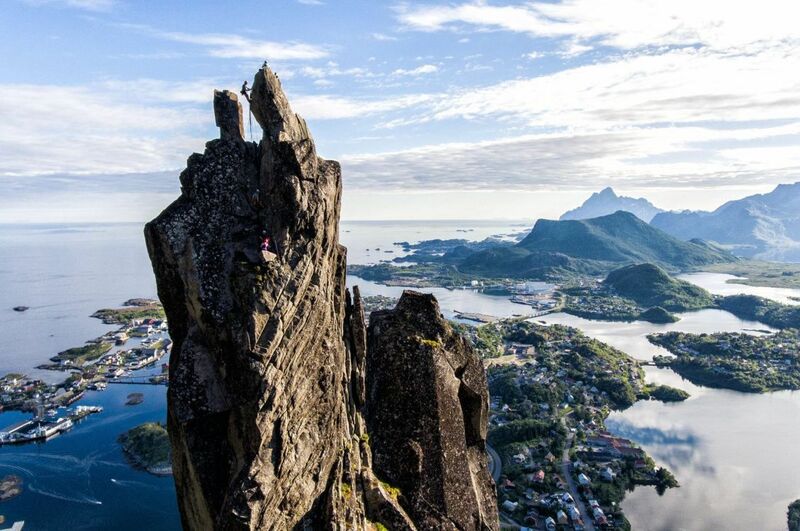 Here is the view from the top of Svolvaer Fløya, if you are looking to add another adventure to your day. The view from Svolvaer Fløya. Can you find Svolvaergeita in the lower portion of the photo? Want to see more? Check out our video about climbing Svolvaergeita, which is a mix of Go Pro and drone footage. We used Northern Alpine Guides to climb Svolvaergeita. They were fantastic! Their guides have lots of experience not only in Norway but at rock climbing locations around the world. Included in your fee is use of their equipment, so the only things you need to bring are snacks, water, a backpack to carry the gear, your own transportation, and a good sense of adventure. Cost: 4000 NOK for one person, 2000 NOK per person for 2 – 3 people. If you have more than 3 people in your group, contact them for pricing. 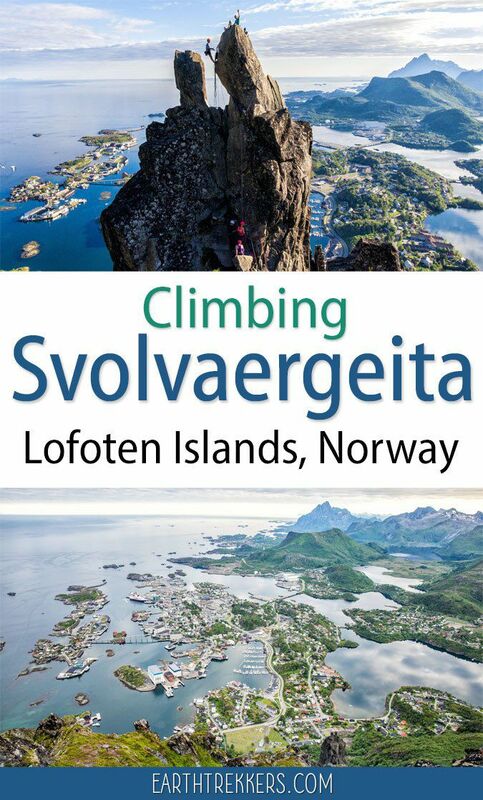 Northern Alpine Guides claims that they can take beginner rock climbers up Svolvaergeita. I’d classify us as beginners with experience. 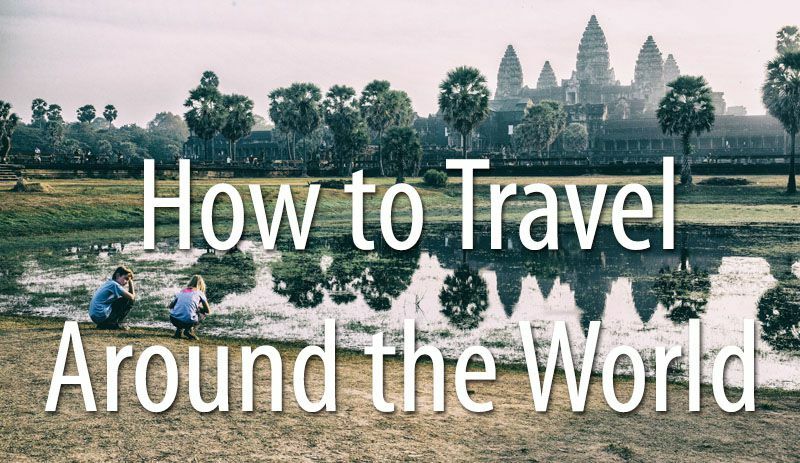 We climbed in Krabi, Thailand and Mendoza, Argentina. 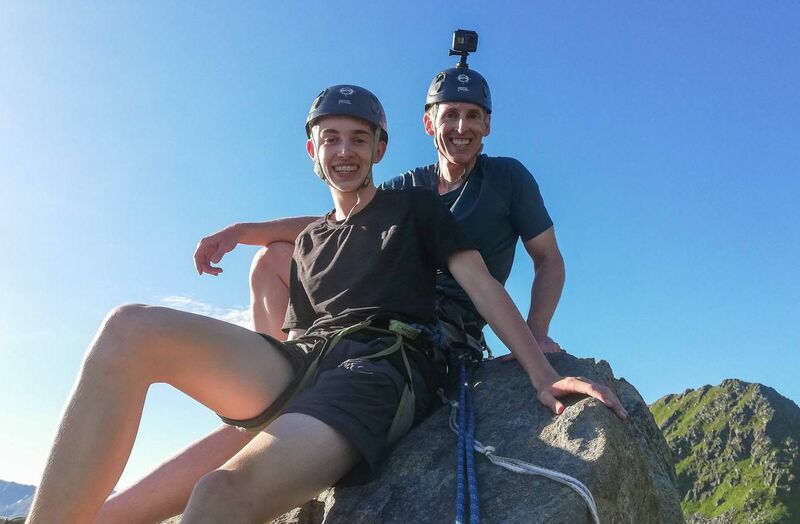 For us, this climb was the perfect level of “challenging.” There are lots of handholds and footholds, so it is easy by rock climbing standards, but there is also a lot of exposure. If you are brand new to rock climbing, I would not recommend making this your first outdoor climb. If you are traveling with kids, contact Northern Alpine Guides for their recommendation. Tyler was 15 and Kara was 13 when we did this. Plus, Kara has one year of experience on a rock climbing team in our home town, and she made Svolvaergeita look easy. We stayed at Nyvågar Rorbuhotel in Kabelvåg, a 15 minute drive south of Svolvaer. A rorbuer is a classic fisherman’s cottage that has been converted into a hotel room, that usually comes equipped with a kitchen, living room, and private bedroom. We had a two bedroom cabin with the bedrooms on the second floor and the kitchen and living area on the lower floor. 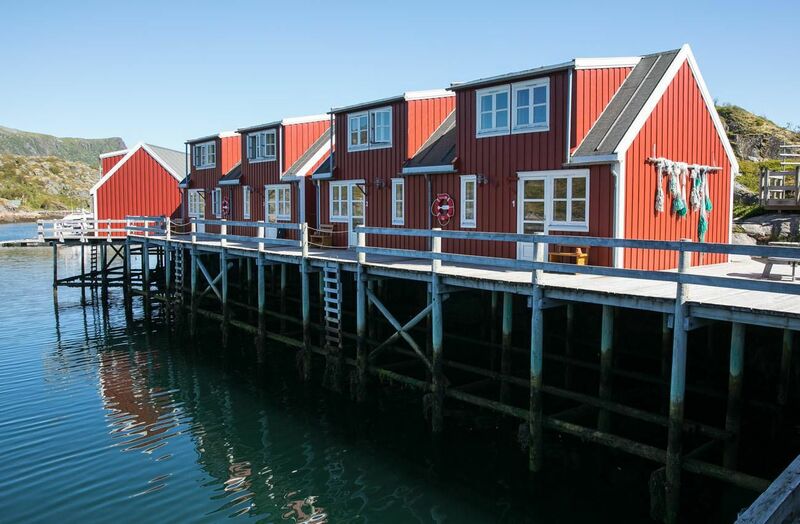 While visiting the Lofoten Islands, it’s worth staying in a rorbuer at least one time. Nyvågar Rorbuhotel also has an onsite restaurant and breakfast was included during our stay. Does this look like something you would like to do? Comment below if you have any questions or would like to offer advice to our readers. 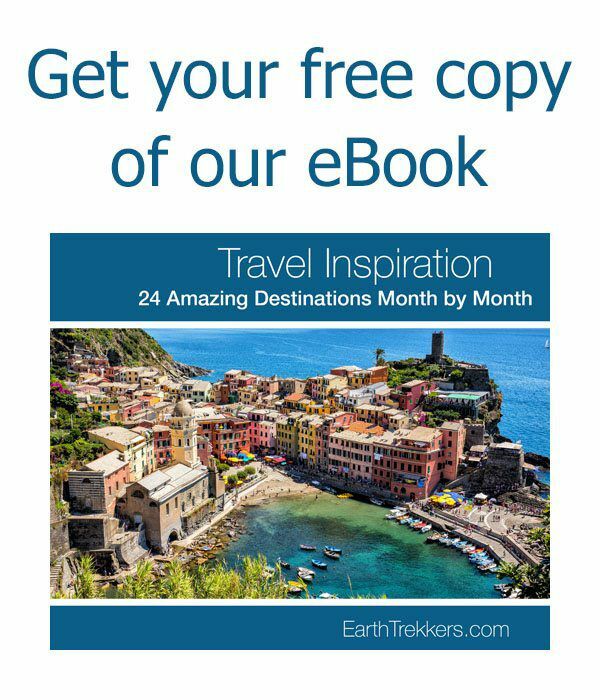 Planning a trip to Norway? 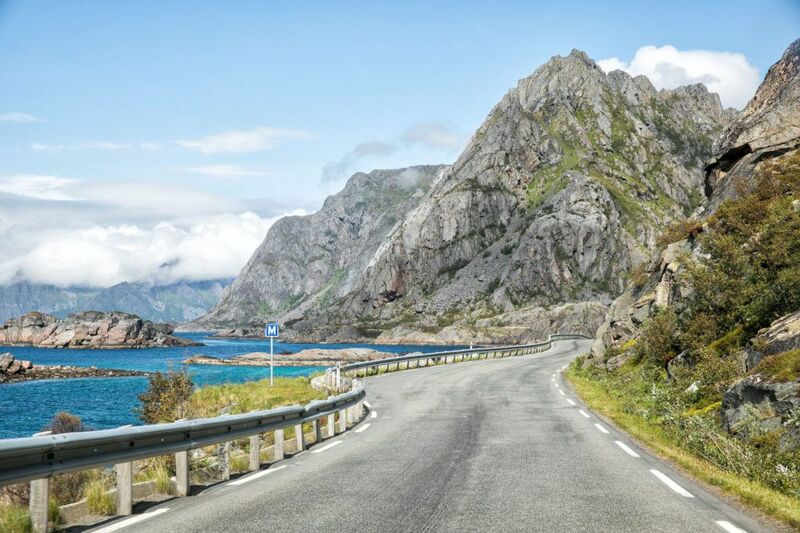 Read all of our articles on Norway on our Norway Destination page. 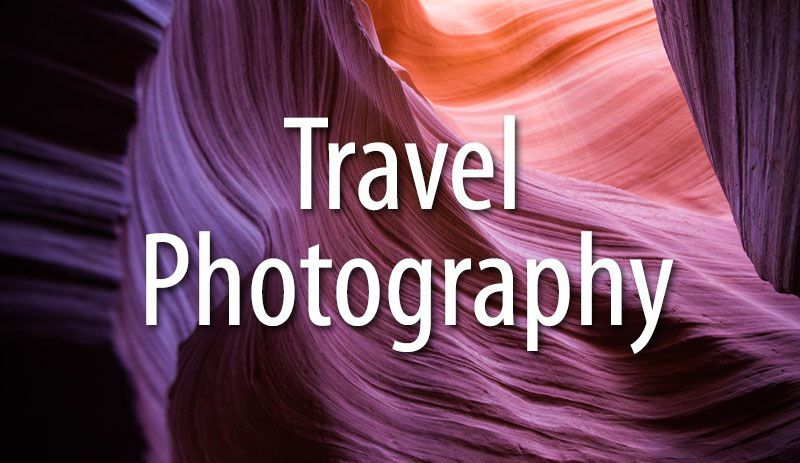 Hi there, your photos are amazing and I have read so many of your posts – love them! 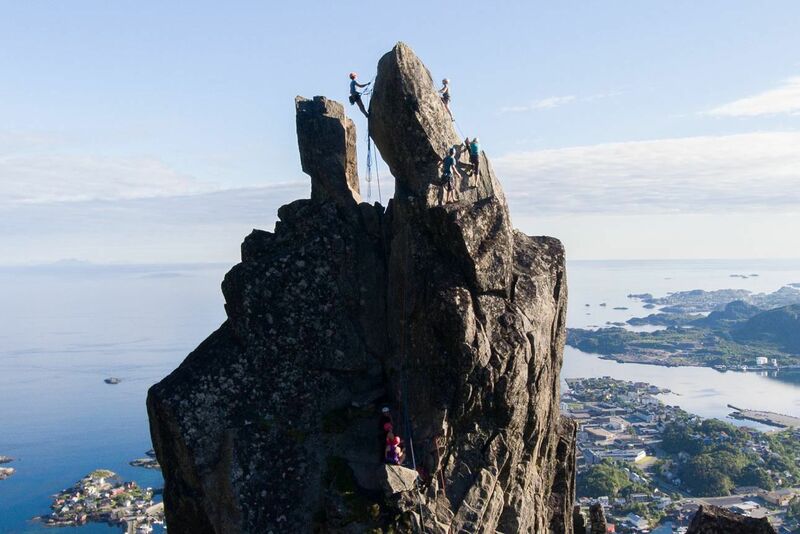 We are planning on climbing the Svolvaergeita but wanted to know whether we need a drone in order to take that photo of you sitting on top of one of the horns and waving (or whether this can be done by someone else down below or elsewhere). Would really appreciate your advice, thank you! Kind regards,Kerrie. 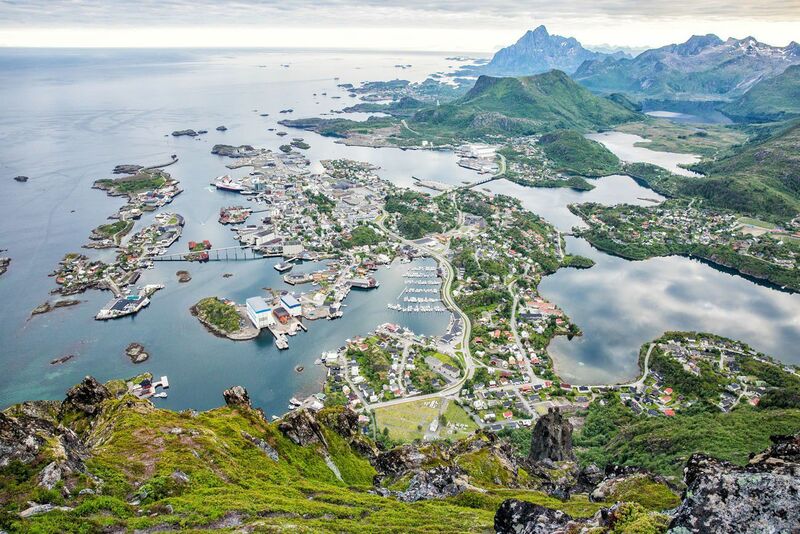 The view from the top of Svolvaer Floya is so appealing that I feel like doing the hike right away! Is any portion of the trail to the top really narrow and airy? I’m somewhat acrophobic; so I’d like to get some first hand information prior to my decision making. Thank you so much for such tremendous effort you guys are putting into to make this website unique and helpful! The post is published: Hiking Svolvaer Floya in the Lofoten Islands. Hope this helps! On the hike on the way up, how are the views? 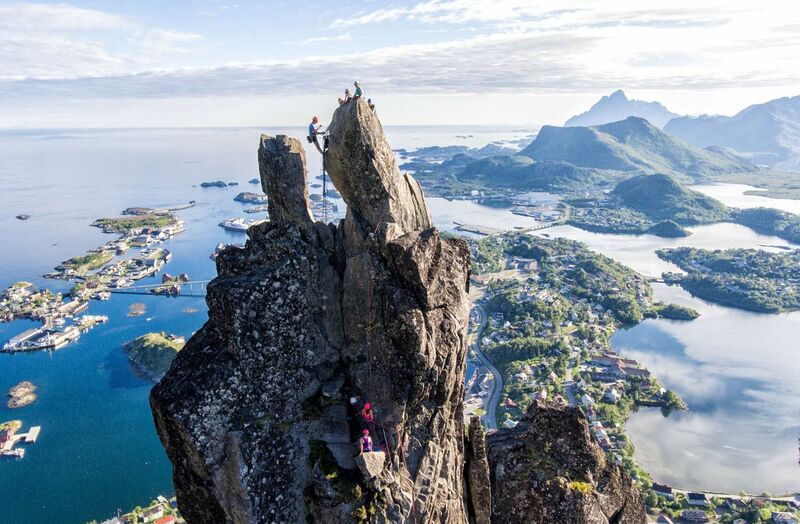 We’d like to see some views from above Svolvaer but not rock climb the goat or go all the way up to floya. Is it worth it to climb just partway up for views? Also, did the islands feel crowded? Will be there in a couple weeks and you hear a lot about crowds these days. Yes, I have also heard about how crowded the Lofoten Islands are, but they did not feel that way, not compared with hiking trails and other spots in Europe. However, Reine got crowded midday, as day trippers from Svolvaer and Leknes drove down to visit. 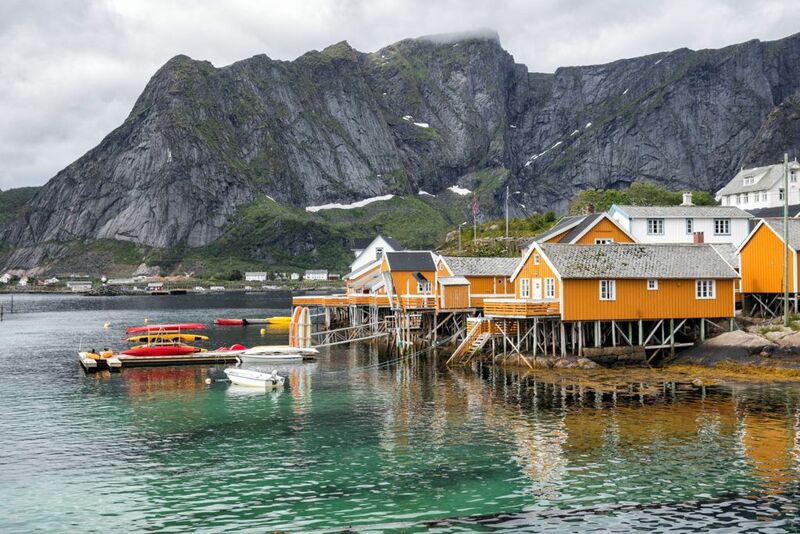 But Reine and Hamnoy are almost ghost towns before 9 am and after 6 pm. We stayed in Hamnoy and loved walking around after all of the cars and tour buses left.